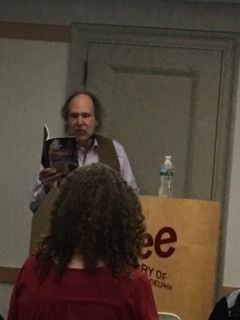 Hey, I don't usually post reviews of my own readings at science fiction conventions, bookstores, and libraries, but the Galactica Philadelphia event tonight at the Free Library of Philadelphia featured not only me but the best-selling fantasy novelist Sarah Beth Durst, so I think that makes it ok for me to review it. Even if not, I still want to tell you what a great time we both had, doing our respective readings, and afterwards at the Kite and Key (pub), sitting next to and trading stories with Lawrence M. Schoen and Sally Wiener Grotta, who organized the event, which was sponsored by the Science Fiction and Fantasy Writers of America. 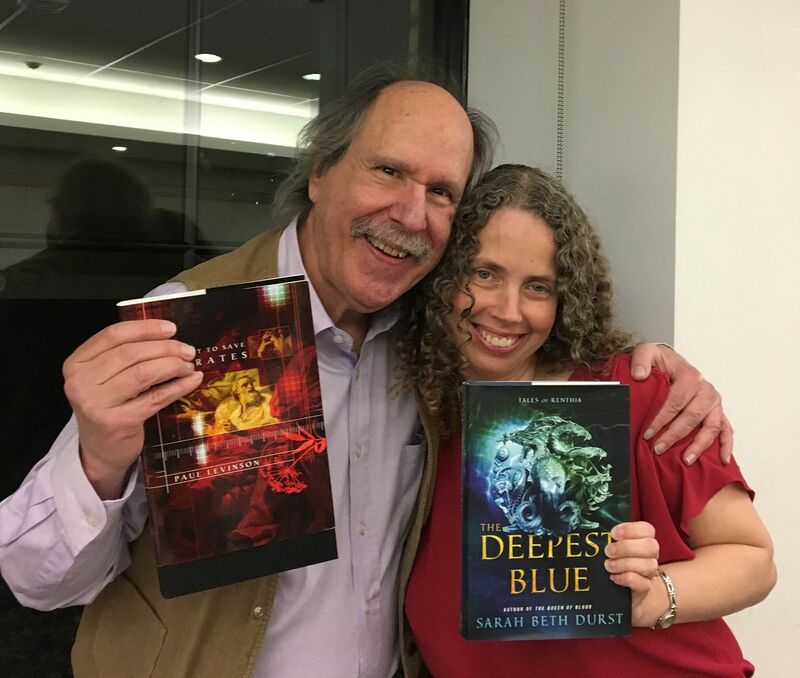 First, it was wonderful to be part of a double-bill with Sarah, whom I first met at conventions and book signings at the beginning of the 21st-century, when, as she so aptly put it, she was "dreaming" of writing and publishing her first book. Wow, did she succeed. She now has more than twenty novels of adult, YA, and middle school fantasy in print, and read tonight from her latest, The Deepest Blue. It's a beautiful, vivid, watercolor gem of a story. On the subject of watercolor, I read from Marilyn and Monet, my novelette, which may be in the very earliest stages of being made into a movie. They'll be video of the readings put up on Galactica Philadelphia's web page in the next few months. In the meantime, here's a video of a reading I did of "Marilyn and Monet" at Readercon a few years ago (thanks Phil Merkel). The library venue was excellent. We both sold a lot of books. And it was great to see some old and new fans. The time at the pub was out of this world in a different way. There are few things as fun for science fiction writers as swapping stories about famous writers and their infamous behaviors. No, I'm not going to tell you who they are. But if you're a writer, and you get an invitation to do a reading at Galactica Philadelphia, I'd recommend you do it. You'll be in for one if the best readings and aftermaths of your career. Sorry I missed it, Paul! I live in Philadelphia, but was in Canada till late yesterday. I'm sure it was a blast. It was wonderful, Bonnie! Would've been great to meet you at last, but they'll be other times. I attend Philcon just about every year - in November. I'll be sure to let you know as we get closer to that month.